After bagging up on predators the previous day UK angler Andy decided to try fishing for the carp in the early part of the day. After several hours carp fishing without any action, a changeover to lure fishing saw the angler straight into fish with several Alligator Gar in addition to Pacu taking an interest in the anglers swimbait. A change to deadbait saw the angler starting to pick up a much better stamp of fish with a shoal of Redtail Catfish constantly homing in on the baited area. In the convening hours Andy landed various hard fighting Amazon Redtail Catfish with weights ranging from 20-40 kg. Having already landed literally dozens of Redtail Catfish in the last two days the angler decided to change tactics and was soon casting a float fished bait towards a group of fish showing out in the lake. With fish clearly taking an interest in the bait it wasnt long before the float slid under the surface and a fish was on. The fish immediately powered off across the lake on a high speed run before crashing out on the surface on the far side of the lake. A ten minute battle followed which saw a large Chaophraya Catfish finally netted by the guide. 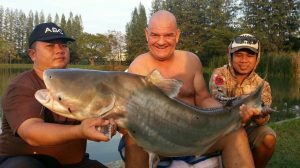 The Chaophraya Catfish was estimated to weigh 40 kg’s. Bait fishing at IT Lake MonstersCanal fishing at the Mae klong River in Thailand.